of the year, with a view of a cold winter scene through a window. In addition Frilly & Funkie would like to see what we are inspired to achieve this year, for me it is to create Christmas cards all year long! I am not sure of the technical term for this kind of card but I call it a book box card, I am not going to go into any detail about it's construction as there are so many tutorials available on YouTube. 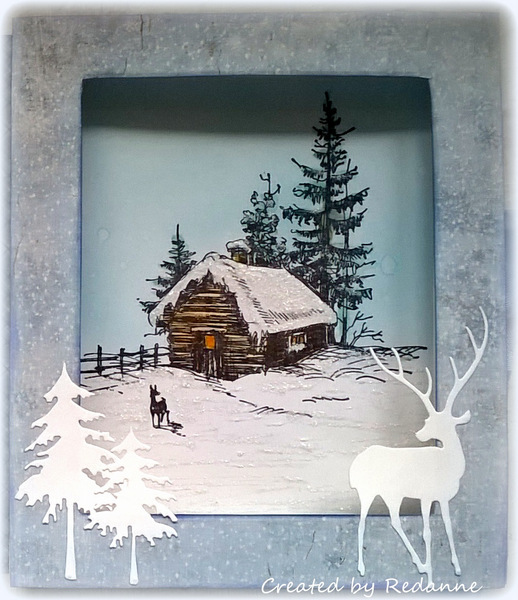 I started by making the 'book' element which measures 6" x 5", stamping the Tim Holtz Scribble Woodland view and die cutting the Sizzix window, which was cut twice, along with a piece of acetate for the 'glass'. The sky was coloured with Distress Ink, the cabin and trees were coloured with Distress Markers and I used Distress Stickles on the ground part. The outer part of the book box was created by cutting a piece of patterned cardstock (Maja Design) 6" wide and 11" in length to cover the front, back and spine of the book box in one single piece. I added the strip of card around the middle to hide the ribbon closure. friend Sara Emily of Sarascloset - thanks again Sara! 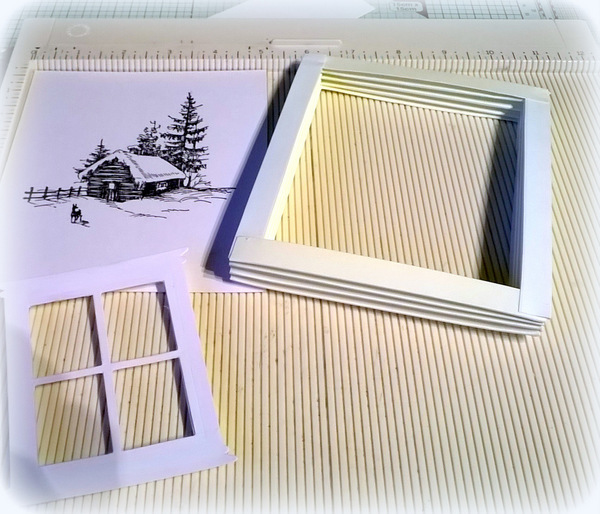 Another aperture was cut into the front part of the book box, measuring 3.3/4" x 2.1/2" to fit the window frame. One window was attached to each side of the aperture with a piece of acetate between to form the 'glass' part. Finally, I added some die cut foliage (Tim Holtz). The berries are from Tim's Idea-ology range (Pearls) and I coloured them using Ranger Alcohol Ink in Red Pepper. The sentiment was stamped in Ranger Black Archival Ink. So that is one card down, just a few dozen more to make. 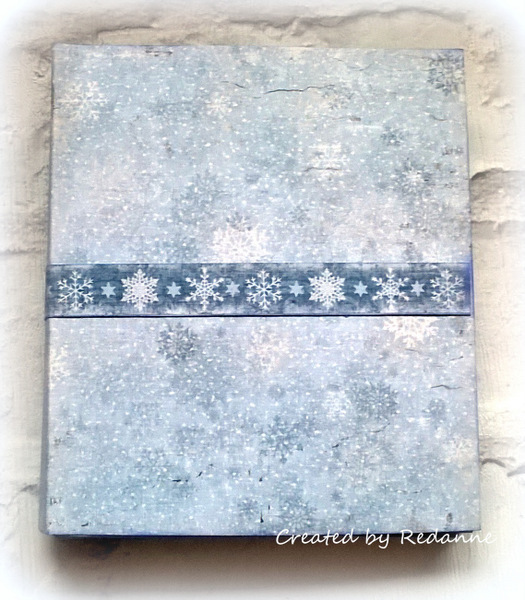 I am joining in Craft Stamper's January challenge which is Anything Goes! I would also like to join in Emerald Creek's latest challenge - #4 - Bring on the New - my new items are the gorgeous Tim pearls and the Maja Design papers I purchased specifically for this project. Thanks for your visit, hope to see you again soon. I love the dimension in this piece. It is beautiful. The coloring of the woodland stamp and the background are so pretty. I would love to have this on my mantle (if I had a mantle). 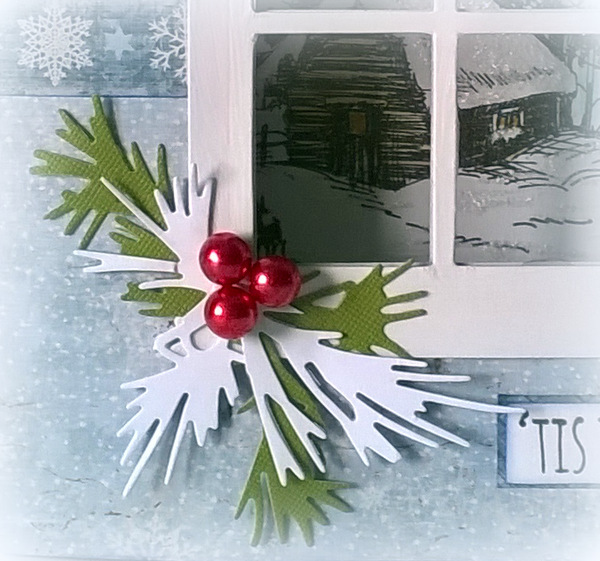 What a fabulous way to start your Christmas card makes - this is stunning. What a gorgeous card Anne, I love these 'box cards' (I call them that too). So perfectly executed as always, beautiful! Sweet window looking onto a gorgeous wintery scene. 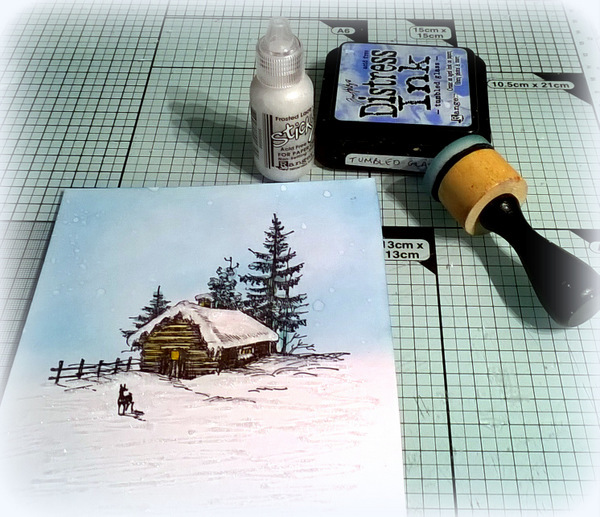 Love your book card and a great resolution to create Christmas cards all year long! Thanks for joining us in the Frilly and Funkie New Year challenge! Gorgeous make Anne! Love the design so much! Wow, Anne! This is gorgeous, and your design is fabulous! I love that image! I think your resolution to create Christmas cards all year is one I need to adopt! Sending healthy wishes and hugs! Fabulous book-box-card (!) I love this blue, so perfect for the season. Oh wow Anne, this is such an amazingly clever design and so beautifully put together!! I love it to pieces with all those fantastic elements you have added! I am also full of admiration, but you are probably right, this is the way not to get stressed come November. My problem is I'm just not in the mood yet, but thanks for the inspiration and this great idea! Making the book frame is fabulous Anne! What an original and gorgeous project, and the scene so wonderful! This is stunning, Anne! I have seen a few tutorial videos on this type of card but haven't tackled one myself. You have inspired me to try. Anne, I just LOVE this card! You have obviously used a great deal of thought to putting it all together - love the white trees and the dear and that cabin....well, it is wonderful! What a great idea to carte Christmas cards all year! You will certainly have enough hopefully for next Christmas. I am always scrambling at the last minute! Thanks so much for joining us at Creative Carte Blanche! (Oops! Sent comment before I finished)...You will have quite a collection of gorgeous cards to gift your lucky friends with this holiday season. So delightful! I loved it when we lived in the mountains and could watch the falling snow through the window. I know I miss the snow but I love it here too. Boy this card looks hard to make - do I dare try? It would take me the rest of the month to make!! Love your cards Anne - they are always wonderful and so professional looking. Can I get on your Christmas card list? This is gorgeous! I love the color palette and the clever design. Gorgeous stamping and so much dimension! Thanks so much for sharing with us at the Frilly and Funkie New Year Inspiration Challenge! Oh how I adore this project Anne! The inside scene with the wintery cottage is a dream scene for me! Snow and ice and a forest full of deer, can't go wrong with that! Your added die cut trees and deer give the scene a real 3d feel to it, I could climb right inside! Your cover is just as brilliant. 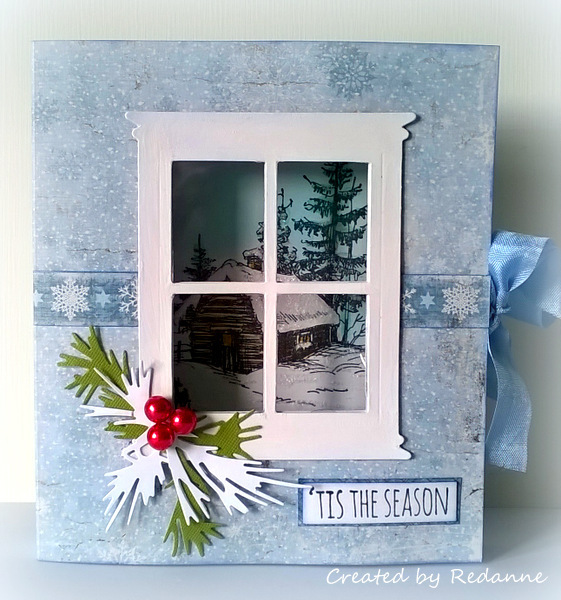 The window cut out completes the 3D feel, and that ribbon is just delightful! A stunning wintery make my friend. Absolutely CHARMING and LOVELY Anne. WONDERFULLY done in every way. Xj. Fabulous 3D project. 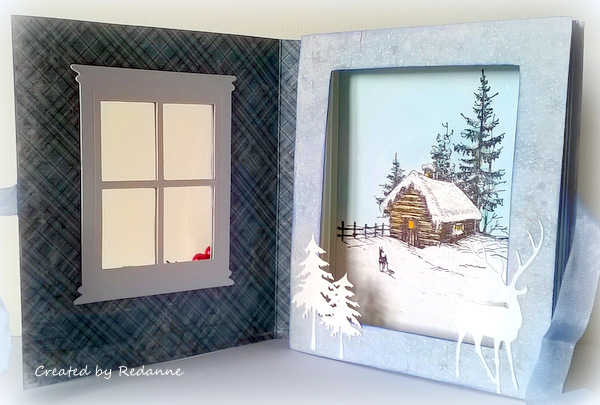 Love the wintery scene as you look through the window. This is going to be a very special Christmas card for someone. Thanks for joining us at Frilly and Funkie. Love the wintry scene you've created and dimension. Well, you know I love peeking through windows, so this is right up my street - what a wonderful construction and a gorgeous wintry scene. Good luck with the year-round Christmas cards - you'll be well ahead of the game if you manage it. Stunning! Anne and thats with a capital 'S' . Just love the concept, the design and of course the superb execution . Exquisite my talented friend . I already loved this on facebook Anne, but I wanted to come and officially LOVE LOVE LOVE it and take a closer look. I'm going to follow your wonderful lead and get started on mine too. Such inspiration! Thanks for sharing and thanks for joining us at Frilly & Funkie for the New Years Inspiration challenge. Yippee, Anne! I saw this was a Top Three at Frilly and Funkie! So well deserved; this is a beauty of a project! And good for you to get your Christmas cards started early! I will be sending you a proper e-mail, but wanted to let you know your package arrived, apparently this weekend while I was out of town! Yippee for you and Yippee for me! Sending hugs! This is so lovely and amazeballs dearie. I so enjoy the way you make everything seem so effortless and gorgeous but I know it's not. Haha. The distress coloring in the cabin is scrumptious and the box is beautiful. I could live in that cabin (as long as there was lots of wood and a good wood stove). Fantabulous and Wowzers design! Hugz to you muffin!